Deep in the Gobi Desert, the investigators discover a strange artifact amidst primordial fossils. The alien device is a gateway to a conduit to travel throughout the cosmos, known as The Great White Space. The investigators are then propelled to an alien world ruled by the Elder Things, a strange alien race of macabre scientists. 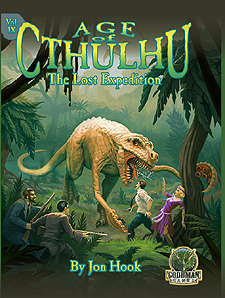 Desperate to find a way home, the investigators must survive a hostile and alien world filled with mutant dinosaurs and the Elder Thing's amorphous and putrid slave-beasts, the shoggoths!